Fiiiiinally this book is on its way to us! Why is it not March yet?! I need this! I need to read this series! Great pick! Or you should binge-read the series in March! No crazy waiting. :D Thank you! Awww! The books are dense but so good. You should binge-read the series, Eve! For real! March... and this coming month (September)! I'm a little overwhelmed. In a good way! I am going to have to get caught up with this series before this one come out. It sounds so good! I still need to start this series. This book coming out definitely makes me super excited, hopefully I can read the first two before this one comes out. I really gotta start reading these books soooonn. I am so behind. SO many books, so little time is so apt here. lol. 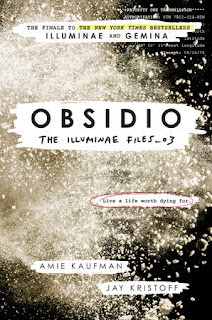 The saddest thing about BEA/BookCon this year, was no Illuminae Files book. I adore this series and am definitely, eagerly waiting for this one. Oh I can imagine! Hopefully this book will be here before we know it. YES!! This was my pick for the week too. :) March needs to get here already so I know what the heck happens to all the characters! There are so many things needing to be solved, and I'm so excited to see how Kristoff and Kaufman do it. Great pick this week! Here's mine! Obviously great minds are thinking alike. ;) Great pick, lady! I haven't read the series but I hope you enjoy it when you get it! Thanks for visiting! I can't believe this is book 3 already. Sheesh time is flying by! This is another series that I haven't gotten to start yet. I picked it up at the bookstore but put it back down and told myself "no!". lol! I want to get through some of the books I already own before starting something new. I've heard nothing but great things about this series tho! Hope you love this one when you get to check it out! I still have to read the first book, but I heard so many amazing things about this series that I REALLY wanna try it! Excellent pick! I just read Illuminae this summer, absolutely loved it, and can't wait to get my hands on the second book before this one comes out.